Hello from Caen, France. The sail from Cherbourg was a Journey Magnificent. We left just after noon on Wednesday with a following breeze and sea, and sailed almost to the harbor entrance at Caen before the winds shut off for the evening, causing us to have to motor in the rest of the way. 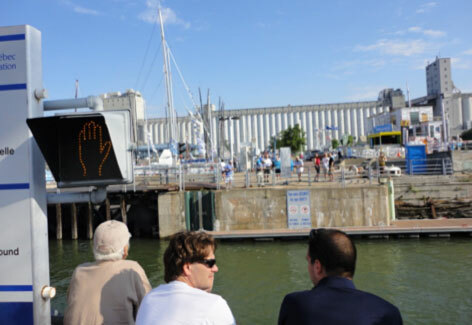 At around 10:00 pm, we motored into the lock which controls the water in and out of the harbor, and then up the channel to the center of the city (nearly a two hour trip!) 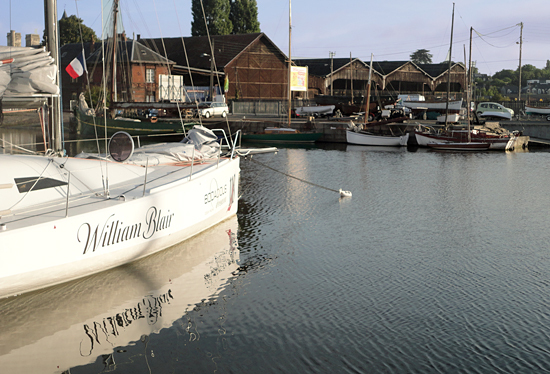 – where the stage is set for the Normandy Channel Race which starts this Sunday. Pierre, a friend of Halvard Mabire and Miranda Merron from Campagne de France (our friends and close competitors in the last two races,) made the trip with me. He’s a fun character who not only made the time go by quickly, but made the passage through the locks and bridges much easier, with him interpreting the French language for me. I’m getting better with my French, able now to order food and get what I expect, talk to a cab driver, rent a car, talk with hotel staff and purchase my du pain au chocolat and jus d’ orange in the morning!! Give me another month, and I’ll see what else I can learn. Pierre at the helm just outside of Caen, France. 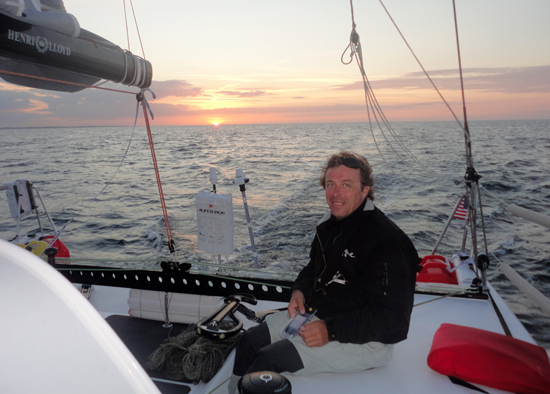 Matt Scharl, my co-skipper, arrived yesterday afternoon ahead of us and was able to scope out Caen and set up things for our arrival. We connected today, reviewed the work list, made contact with the race directors and sorted out our plan of attack for the next few days in preparation for the start. So far, things are looking quite good. Each race we do gets a little easier as many of the tasks we do to prepare for them only need to happen once. At this point, many of those items are in place, and don’t need repeating – so that gives us more time to focus on the race itself. This race is a rather complicated one in that it starts with a triangle course around some local marks before heading to a mark off the French shore. Then the course heads north to marks along the English shore, then across to Ireland for a couple of marks including the famous Fastnet Rock, before heading back to Caen. At 1000 miles long, there are plenty of provisions to shorten the course or change it to make the sailing fit the time schedules of the race. The last couple of races have had shortened courses, and with the early weather predictions for light winds here, who knows what the final course will be. That will make it interesting – not just for us, but for you following the race as well. So hang tight, and follow our updates on the website and Facebook, as it’s gonna be a fun one. And good luck to all our friends back on Lake Michigan who will be sailing the Tri-State Race. Not unlike our race.. three states, one weekend.. we’re three countries, one week. Hoping the summer warmth remains for you. With a new perspective on Ocean racing vs. Great Lakes racing.. I can tell you that many of those Tri-State Races were just as cold and wild as the North Atlantic was this year. 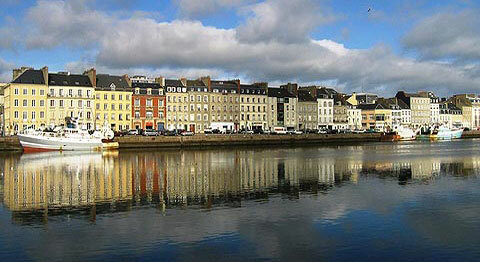 As I write this, it is morning here in Cherbourg, France. The time I’ve been here in Cherbourg has been sweet. I am spending some of it relaxing and lots of it making repairs and modifications to Bodacious Dream, in preparation for our next race, the Normandy Channel Race, which starts September 2nd. That’s this coming Sunday! The time till then is going by very quickly! 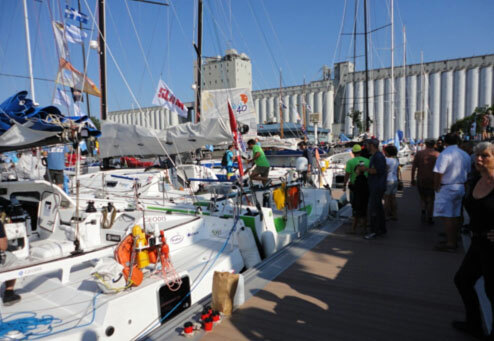 So, with the tiller welded and repaired, autopilot instrument replaced, vang reworked, halyards reworked, leaks stopped, new handholds, sails repaired and a lot of other smaller items taken care of, it’s time to leave Cherbourg and sail to Caen for the start of the race. We’ll be leaving here tomorrow about noon – I hope, as all sailing around here depends on the tides. The two headlands – one to the west and the other to the east have tidal races where the currents run 7 knots or more, and if the wind is against the tide, the wave action is severe. So, you play your passage according to the tides. There is nothing quite as much fun as having the tide going with you, boosting your speed by the speed of the current. So, if we have to motor in light winds at 6 knots boat speed with a 7 knot current, we’ll be making 13 knots. Against it, we’ll just have to wait. So, the Normandy Race is 1000 miles. We start in Caen and sail across the English channel then along the southern coast of England and out to the famous Fastnet Rock (the last sight of Ireland for emigrants sailing to America) and then back to Caen via one of the islands. I expect this to take us about five or six days, weather pending of course. 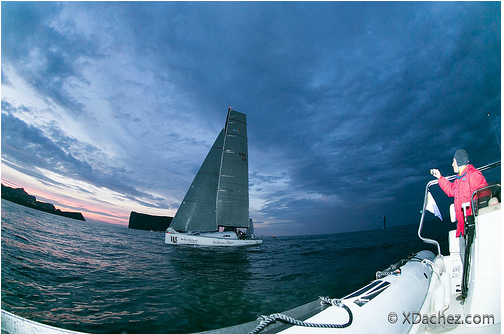 To follow the race, set your sights on www.normandy-race.com. There’s a ton of information and tracking to follow our progress. There is a great line up of competitors, many of whom are the biggest European names in the sport, so we’ll certainly have our work cut out for us to stay ahead of them. 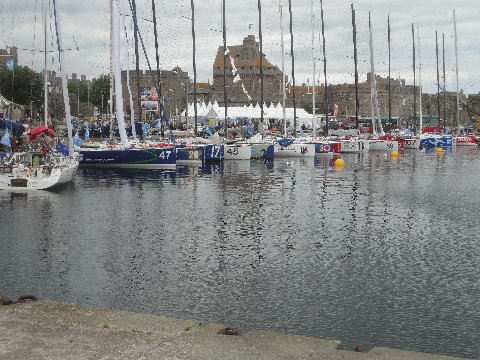 I’ll be sending another write-up on the Quebec-St. Malo race here shortly. Sorry for the delay on that, but gettin’ comfy with these new electronic media thingies takes a bit of time for this ol’ grey-haired sailor!! The River Portion Race day in Quebec City, July 22nd, dawned warm and sunny as predicted, but with more wind than expected. The last minute scurries all went well… breakfast for Mark and I, weather for Matt, details for Emma… check out of the hotel, drop the crew, drop the rental car, return to the harbor… a typical busy time. And as it would work out, the boats were on the other side of the lock, which was open when I got there and heightened my anxiety wondering if it would close so I could get to the boat. It did, but then again, trapped Emma on the other side… and once again they closed it to let the crews over. Never a start without a last minute worry!! We exited the harbor to cheers and announcements over the loud speaker… something new for us Americans but typical in these events. The boats paraded up the river to the starting area and spent time sailing about the river giving the press the opportunity to photograph the event. Quickly enough, the start gun fired and the fleet was off on a downwind start, colorful spinnakers flying in 10 to 12 knots of wind, gybing back and forth in close quarters past the beautiful waterfront of Quebec City. The race organizers couldn’t have asked for a better situation – 21 Class 40’s, another two monohulls and five multihulls filling the waterfront with colorful sails on a beautiful Sunday! Wish I’d have had the time to take a few photographs of the show, but I’m sure the picture was better from the shore. The winds and currents in the river kept the rankings continuously changing. One moment we’d be up in the front of the pack, the next gybe we’d be further back… a current change and we’d be smoking boats… and then, in reverse, it’d be our turn. Through the entire afternoon and into the evening, we’d considered various routes down the river — constantly referring to the tide and current charts we’d acquired to predict where the best places might be. And as it would be, as night fell, the winds let up and we all struggled to keep the boat moving forward again, constantly watching competitors move forward and then back aft. This sailing went on for two days… working gybes and sail changes, watching currents and navigation and wondering where competitors had gotten off to and when they might show up again. The one beautiful distraction to it all was the occasional sighting of a whale and the wonderful sighting of Belugas… so magical — almost glowing white against the blue waters. At night, when the winds had gone away and our progress was marginal at best, sometimes only forward by way of the currents, you could see the stars overhead and hear the sound of whales blowing around you. And as if that wasn’t enough, the lonely wallow of a Northern Loon would break the stillness giving a grandness to this St. Lawrence River. As a Great Lakes sailor, I’d always thought of sailing out the St. Lawrence. Next time, I’ll take my time and make this part of the trip last a few weeks. There’s so much unspoiled grandeur to be explored. The race spotted six “marks” along the route out the St. Lawrence at six different harbors along the way. This gave the residents the chance to enjoy the race passing their shores and provided the fleet an opportunity to consolidate and reconnect with their competitors. A few of these marks were especially beautiful coming near sunset with a beautiful backdrop of a small harbor and lights… and some came in the middle of the night. Most all of them came with some frustration as the winds turned fluky near the shores. More than once we saw huge swings in leads and positions pending our location with the wind and currents — fun if you were on the good side of things and not so much fun if you weren’t. One especially un-fun situation occurred late at night. Mark and I were on watch and blasting along the shore on a Jib Reach, Matt and Emma has passed a few boats on their watch and had left three or four for us to catch. We were overtaking them one at a time and feeling pretty good about our position having moved to the front of the pack, when we learned from Matt that we were supposed to turn a mark just behind us… Mark and I had wondered why the other boats stayed so close to shore!! Embarrassed, like scolded little boys, Mark and I tacked about, returned and rounded the mark, our lead now gone and in sixth place in this pack of boats. With frustrated determination, we worked hard the next hour and passed all six boats once again. We wondered the rest of the race how we might have advanced with winds and currents if we’d not missed that call. Be assured, that story will get better as time goes on, and likely in about five years, we’d have won the race if we’d not missed that mark!! P.S. If you have the chance, pick up a copy of Sailing Magazine and read the story on the Atlantic Cup Race!! Bodacious Dream and I are now in Cherbourg, France. We left St. Malo on Saturday with a young man named Julien who was introduced to me by friends on Campagne de France. Julien is a great young sailor with an energetic and fun attitude. Together we covered the 100 miles to Cherbourg in about 15 hours, in what I’d call a very pleasant sail. On the way, we passed the Channel Islands of Guernsey, Jersey, Sark and others. Interesting areas I’ve heard about and read about through history and sailing. Now I’ve been there!! I’ll be here in Cherbourg for a couple of weeks before we head to Caen for the Normandy Channel Race which starts on September 2nd. 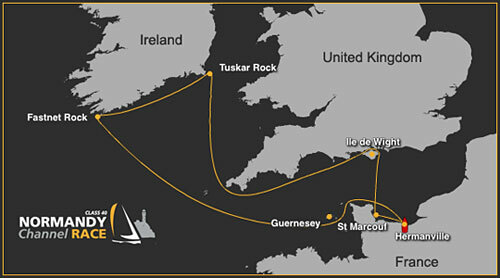 The Normandy Channel race covers 1000 miles of the English coast line out to Fastnet Rock and back to Caen. Again we will be up against some great competitors, many of whom we haven’t yet met, which will make it even more fun. While here on the Normandy coast and in Cherbourg, I plan to take some time to visit and see some of the historic sites of World War II and the D-Day Invasion. This will be interesting as I remember the stories my Uncle Frank told me of being in the first wave on D-Day. I’ve been working on more updates on the St. Malo race for you, and will be sharing those here in the next couple of days. In the meantime, if you’re up for a few great short stories, I have a great link for you — let me explain. Harry Mark Petrakis and his wife Diana have been like a second set of parents to me since I was very young. Dean, their son and I grew up together and Harry was always offering up advice and wisdom as we came of age. Since those years, Harry and Diana have always looked out for me, often finding work for me when times were tough and gave me much of my first starts in construction. Harry has spent a lifetime writing short stories, novels and a major motion picture — A Dream of Kings. His works are regarded as major contributions to literature. On occasion, Harry writes an essay which is published in a Chicago newspaper, the Sun Times… the series is seven or eight pieces long at this point, and the most recent one was published this past weekend. It was forwarded to me by Mark, Harry’s oldest son and the architect of our web and social media presence. And on an additional note, Diana, the steadfast matriarch of the Petrakis family and the one who has kept watch over us all, celebrated her 90th birthday yesterday!! Happy Birthday Diana!!! So if you care to read a sweet recollection about the hobos that came thru the small Chicago diner that Harry owned in the 1940′s and that inspired much of his later writing, here’s the link right here. As for me, it’s back to washing more boat parts, creating a work list and making preparations for the Normandy Channel Race… oh, and following up on more stories for you from the Quebec-St. Malo race. Today’s weather in St. Malo is much improved over the past few days. The sun is out and bright and the temperatures are warm. It has been more like northern Michigan since we arrived, which has made our work of drying out the boat a bit difficult. It’s been a few days of recovering with great French food, lots of treats to choose from, good conversation and laughter with friends and working on the boat to flush out the salt water and dry the gear. The crew has all headed for home now, and I have some time to finish up the boat and develop a work list of items to prepare and fix for the upcoming Normandy Channel Race here in a few weeks. More on that later. St. Malo is a beautiful little town….walled in for security some centuries ago, it was bombed and nearly demolished during World War II, but has been rebuilt with the same flavor of its original design. Coblestone streets, old buildings, neat shops and cafes along with street vendors, artisians and entertainers. Easy on your mind and comfortable on your soul, after a long passage. Here’s a picture of all the boats lined up along the wall with the city in the backdrop, the last having finished just yesterday. We think 118 is the nicest looking one there, but we understand our bias. I’ve got to head over to do some laundry, take care of a few things and hopefully find a quiet spot to write up some more stories from the race to share with you all. Give me a day or so and I’ll have some more updates. Until then….enjoy the dream. Whoa!….what an amazing time we’ve had. We finished the race yesterday late morning, or maybe it was early afternoon…..seems to not matter much when the last 14 days all ran together. It was necessary for us to have a tow after the finish because of a questionable engine seal, so once we finished, they towed us to a mooring where we left the boat for 7 hours and came ashore to celebrate our finish. We were met by the other competitors and enjoyed a couple of beers with them before heading to grab burgers and showers. I’m sure we were a smelly bunch of sailors!! The experience is beginning to set in now. What a beautiful place the St. Lawrence portion of the race is. The wildlife was amazing. Whales everywhere, dolphins, birds…. especially the lonely call of the Northern Loon. If you ever wanted to see that area of the continent, be sure to make time to do it. I certainly hope I’ll get a chance someday to do it at a more leisurely pace. And the trip across the “pond” as the regulars call it, was a blast sail. 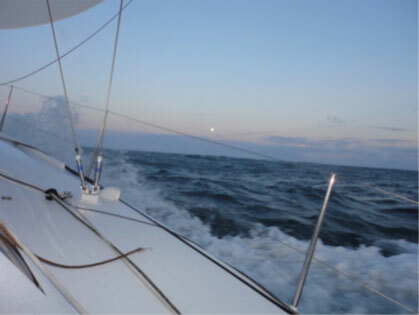 We hit speeds of 26 knots and can’t begin to describe the intensity of the ocean when the wind is up as it was……it seems to me there is enough energy in a couple of waves and the wind to power the world for months!! We spent a few hours today undoing the boat and readying her for a wash out. We have to wait our turn for a hose to clean out the inside. Seems like that will be tomorrow and then we can relax some and figure out our next move. Until then, we’ll just hang out, enjoy the stories with the others, enjoy a BBQ party tonight and rest and restore our bodies. Hope you all have enjoyed the trip with us. We certainly wished we’d done better in the end finish, but given this was our first trans-oceanic race and we lost a couple of sails, had some gear problem and had to nurse the boat some, we think we did well to keep the power on and pick off other competitors right up to the end. Stay tuned for more stories!! 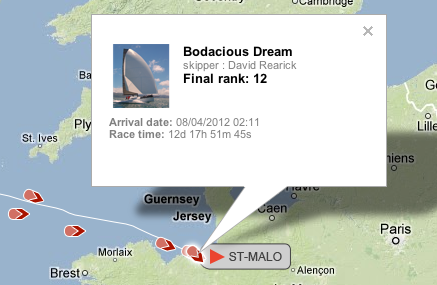 Bodacious Dream at the Q-SM Finish Line..
Bodacious Dream arrives in St-Malo – with a highly respectable time..
Way to go, Bo Dream! I awoke from my off-watch this morning to the first sighting of France. The opposite watch was thoughtful enough to provide a sunrise to go along with it. What a joy!! This past week of North Atlantic weather has brought us little sunshine or warmth. We are all in higher spirits, as we can easily track the mileage left to sail. 3000 miles becomes 1000 miles and then 500, 250 then 100 and less than 40 and now just a short sail. We are excited to see a competitor we’ve caught and hope there may be one more in our target sights before the finish. We’ve sailed hard to come back from the depths of the ranks after a few problems. In just a few hours, we’ll be celebrating and laughing having finished our first Atlantic crossing – a milestone for many a sailor and we are certainly among them now. Just want to thank all our friends that have supported our sailing along the way and throughout our lives, and who have encouraged and helped us to reach for our dreams. Thanks too to Mark and Dean Petrakis who have created our new web presence and have been getting the updates posted and to you all. Great guys!! Thanks to Henri Lloyd for the foul weather gear…it has been blessed and thanked for many times in the past two weeks!! Thanks to Watershed for their waterproof bags… they do float and keep things dry…field tested right here! And a very special thank you to our sponsors William Blair for their support and to Earthwatch Institute for all they do to support the environment and education of it. This ocean is a beautifully amazing place. I’ll tell you more in the coming days.. Remember to Dream Bodaciously. We do!! 85 miles to go. Working our way there, finally a semi-clear starry night. We can see the lighthouses on the coast of France. In every picture I’ve ever seen of people finishing a long ocean race, they always appear to be very happy, I can see why now!! Back into the drysuit for hopefully the last time. 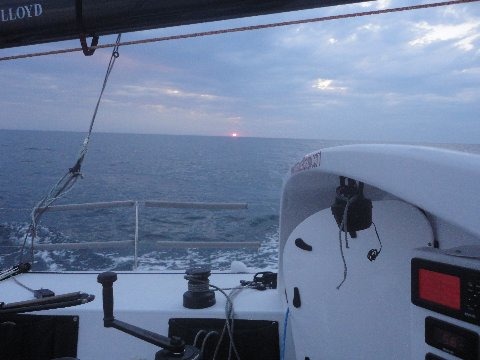 Right now 48 miles from the finish, we have 3 knots of tide helping us. Just looking at the tides at St. Malo, they’re 37 feet. Guess when we will be getting to it – mid-ebb, awesome, a repeat of Newport. As dawn is breaking, there’s a boat right behind us.. Don’t know who it is yet. Taking my iPad, sitting on the hippity-hop and starting to type. Good times.. I am on day 8 of continuous drysuit wear and goggles – hard to get used to, but fully worth the effort. At times the only way to describe what it’s like is to take your average shower head triple the water volume and then stick your face in it for 10 seconds at a time and imagine you’re driving into waves at 20+ knots trying to avoid the next face full, which comes usually within a minute. Sunny day today, first in many.. occasional line squalls, dolphins and even human life, saw a freighter today, first in 6 days.